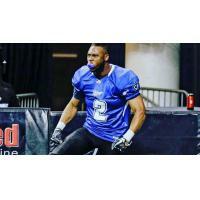 CEDAR RAPIDS, IOWA - The Cedar Rapids River Kings have re-signed defensive back Cedric Dozier to the 2019 roster. Dozier, 5'11, 185 pounds, rejoins the squad after having played in six games last season and earned 21 tackles and four assists in an injury-shorted season, including a season-high, and team leading, eight against Nebraska in the opening game last year. Collegiately, Dozier spent the majority of his time at Cal, graduating from the school in 2015. In his career as a Bear he played in 35 games, including starting all 12 games a sophomore. He had 80 tackles, 1.5 tackles for loss, nine pass breakups and one fumble recovery in his career there. He moved to Kansas State as a graduate transfer, playing in four games and helping the Wildcats to a 9-4 record and win over Texas A&M in the 2016 Texas Bowl. A three-year starter at Lakes High School in Lakewood, Washington, Dozier was considered the best cornerback in Washington and the 24th best nationally in 2012, ranked by Scout. He was ranked the 12th best athlete in the country by Rivals and was in the U.S. Army All-American Bowl after his senior year. Dozier played quarterback, wide receiver, and defensive back in high school.